ਗੁਰ ਨਾਨਕ ਦੇ ਸਿੱਖਿਆਵਾਂ ਦੀਆਂ ਦੋ ਮੁਕ਼ਾਬਲੇਬਾਜ਼ ਥਿਉਰੀਆਂ ਹਨ। ਇਕ, ਕੋਲ ਅਤੇ ਸੰਭੀ ਦੇ ਮਤਾਬਕ, ਜਨਮਸਾਖੀਆਂ ਉੱਤੇ ਮਬਨੀ ਹੈ, ਅਤੇ ਜਿਸਦਾ ਕਹਿਣਾ ਹੈ ਕਿ ਨਾਨਕ ਦੀਆਂ ਸਿੱਖਿਆਵਾਂ ਅਤੇ ਸਿੱਖੀ ਰੱਬ ਵਲੋਂ ਇਜ਼ਹਾਰ ਹੋਏ, ਅਤੇ ਨਾਂਹ ਹੀ ਇਹ ਸਮਾਜਕ ਮੁਜ਼ਾਹਰਾ ਲਹਿਰ ਹੈ ਅਤੇ ਨਾਂਹ ਹੀ 15ਵੀਂ ਸਦੀ ਵਿਚ ਹਿੰਦੂ ਅਤੇ ਇਸਲਾਮ ਨੂੰ ਆਪਸ ਵਿੱਚ ਸੁਲਝਾਉਣ ਦਾ ਕੋਈ ਯਤਨ। ਦੂਜੇ ਦਰਸਾਉਂਦਾ, ਨਾਨਕ ਇੱਕ ਗੁਰੂ ਸੀ। ਸਿੰਘੇ ਮਤਾਬਕ, "ਸਿੱਖੀ ਅਵਤਾਰਾਂ ਦੀ ਥਿਉਰੀ ਜਾਂ ਪੈਗੰਬਰੀ ਦੇ ਕਨਸੈਪਟ ਦੀ ਸਿਫ਼ਾਰਸ਼ ਨਹੀਂ ਕਰਦਾ। ਪਰ ਇਸ ਵਿੱਚ ਗੁਰੂ ਦਾ ਕਨਸੈਪਟ ਖ਼ਾਸ ਹੈ। ਉਹ ਰੱਬ ਦਾ ਅਵਤਾਰ ਨਹੀਂ, ਨਾਂਹ ਹੀ ਕੋਈ ਪੈਗੰਬਰ। ਉਹ ਇਕ ਰੁਸ਼ਨਾਈ ਰੂਹ ਹੈ।"
↑ "Encyclopaedia of Sikhism". Srī Gurū Nānak Dev. Punjabi University Patiala. Retrieved 30 November 2012. ↑ Hayer, Tara (1988). Economic History of Sikhs: Sikh Impact Volume 1. Surrey, Canada: Indo-Canadian Publishers. p. 14. ↑ Khorana, Meena (1991). The Indian Subcontinent in Literature for Children and Young Adults: An Annotated Bibliography of English-language Books. Greenwood Publishing Group. p. 214. ISBN 9780313254895. ↑ Prasoon, Shrikant (2007). Knowing Guru Nanak. Pustak Mahal. ISBN 9788122309805. ↑ "Bhai Gurdas Vaaran". Search Gurbani. Retrieved 1 December 2012. ↑ Macauliffe, Max Arthur (2004) . The Sikh Religion — Its Gurus, Sacred Writings and Authors. India: Low Price Publications. p. 1. ISBN 81-86142-31-2. The third day of the light-half of the month of Baisakh (April–May) in the year AD 1469, but, some historians believe that the Guru was born on 15 April 1469 A.D. . Generally thought to be the third day of Baisakh (or Vaisakh) of Vikram Samvat 1526. ↑ Singh, Khushwant (2006). The Illustrated History of the Sikhs. India: Oxford University Press. pp. 12–13. ISBN 0-19-567747-1. Also, according to the Purātan Janamsākhī (the birth stories of Guru Nanak). 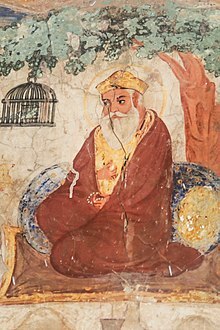 ↑ "Guru Nanak Sahib, Guru Nanak Ji, First Sikh Guru, First Guru Of Sikhs, Sahib Shri Guru Nanak Ji, India". Sgpc.net. Retrieved 9 August 2009. ↑ "The Bhatti's of Guru Nanak's Order". Nankana.com. Retrieved 9 August 2009. ↑ Singha, H. S. (2000). The Encyclopedia of Sikhism. Hemkunt Press. p. 125. ISBN 978-81-7010-301-1. ↑ McLeod, W. H. (2009). The A to Z of Sikhism. Scarecrow Press. p. 86. ISBN 978-0-8108-6828-1. ↑ "Guru Nanak: A brief overview of the life of Guru Nanak, the founder of the Sikh religion.". ↑ Cunningham, Joseph Davey (1853). A History Of The Sikhs. London: John Murray. pp. 37–38. ↑ Gurnek Singh. "Rai Bular". Encyclopaedia of Sikhism. Punjabi University Patiala. Retrieved 18 August 2015. ↑ Singh, Kartar (1984). Life Story Of Guru Nanak. New Delhi: Hemkunt Press. p. 18. ISBN 978-8170101628. ↑ Gurnek Singh. "Sri Chand". Encyclopaedia of Sikhism. Punjabi University Patiala. Retrieved 18 August 2015. ↑ Cole, W. Owen; Sambhi, Piara Singh (1978). The Sikhs: Their Religious Beliefs and Practices. London: Routledge & Kegan Paul. pp. 9–10. ISBN 0-7100-8842-6. ↑ Luis Moreno; César Colino (2010). Diversity and Unity in Federal Countries. McGill Queen University Press. p. 207. ISBN 978-0-7735-9087-8. ↑ Sewa Singh Kalsi. Sikhism. Chelsea House, Philadelphia. pp. 41–50. ↑ William Owen Cole; Piara Singh Sambhi (1995). The Sikhs: Their Religious Beliefs and Practices. Sussex Academic Press. p. 200. ↑ Teece, Geoff (2004). Sikhism:Religion in focus. Black Rabbit Books. p. 4. ISBN 978-1-58340-469-0. ↑ Christopher Shackle; Arvind Mandair (2013). Teachings of the Sikh Gurus: Selections from the Sikh Scriptures. Routledge. pp. xviii–xix. ISBN 978-1-136-45108-9. ↑ W. Owen Cole; Piara Singh Sambhi (1997). A Popular Dictionary of Sikhism: Sikh Religion and Philosophy). Taylor & Francis. p. 71. ISBN 0203986091. ↑ "The Sikhism Home Page: Guru Nanak". Sikhs.org. Retrieved 9 August 2009.